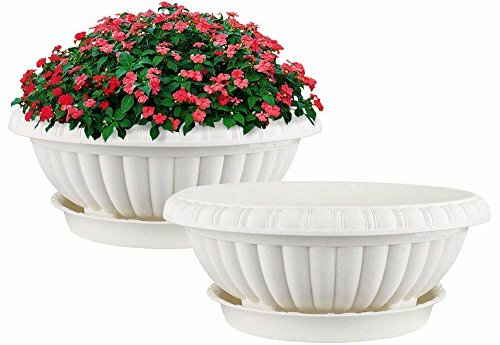 Mkono 2 Pack Plastic Planter Bowl 12 Inches Plant Pots with Saucers, Beige by Mkono at Tulips Orchids. MPN: FBA_YYHPJH001. Hurry! Limited time offer. Offer valid only while supplies last. Set these plant containers on your balcony or patio to add a bit of elegant beauty to your garden. With thick resin construction, these planters offers durability without heavy weight and the risk of breakage. Great for vegetables, herbs, flowers and other plants. Easy maintenance--they have functional bases on the bottom to help drain water and assist the plant roots in breathing. Opening Diameter: 12 1/2". Planter Height: 5". Saucer Diameter: 9 1/2". Weatherproof planters with thicker edge may last for long time use.Mkono is a registered trademark and our product is professional manufacturing and sole selling. STRATFIELD HOME DESIGN Copper Succulent Plant Pots - Premium Set of 3 Mini Indoor Planters - Perfect home decor for succulents, cactus plants, and herb gardens!